Here is where you can post about cards. Here you can ask about ruling question about the game. 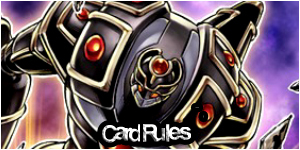 This is where you can post about card rulings or ask about rule of a certain card. This is where you can ask for combos or even post your combos.You can post your strategies or ask for new strategies. Post screenshots and duel videos in here. Here is where you could post your deck to be rated on. And other members can help you with the deck.